This time last year (to the date nearly), I was at Bristol Bike Project at a beginners bike mechanics evening class that my friend was teaching. I pretty much only knew how to change a flat and put my chain back on if it fell off the chain rings. Thanks partly to Bristol Bike Project generally, and especially the women’s night there, I got totally hooked, and had a space to volunteer fixing bikes for project users, and sharing knowledge with other mechanics on various stages on the road to ‘knowledge’. 12 months later, and I’ve literally thrown myself into this stuff, worked really hard, and found myself at a skill level where I can get paid work as a mechanic. 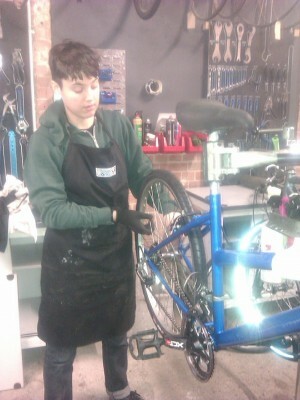 I now work 3 days a week fixing up donated bikes for sale for Bikeworks, in London. I thought this story might be interesting to people in a similar position, who are really interested in doing bike mechanics professionally, or at least spend more of their time doing it, but have limited access to the means of doing so, or don’t know how to progress. The main factor in improving your skills is access to a workshop. Tools for fixing bikes are pretty expensive, and even if you have some, putting your gears out of adjustment and tuning them over and over again with your bike turned upside down in your garden will only get you so far. Only working on a wide range of bikes and problems, and a workshop’s worth of tools (costing £1000+) will start to prepare you for work as a paid mechanic. Many women and gender-variant people (myself included), aren’t taught mechanics by our Dads (or Grannies or whatever! ), and don’t grow up fixing our bikes, and don’t often have a natural progression into paid work as a mechanic. So public workshops, and women and gender-variant spaces are especially important for ‘us’ to gain any access. Unfortunately, they’re still few and far between, but many are mentioned on this site, and include: the Bristol Bike Project, the Pedaller’s Arms in Leeds, and 56a Bike Project in London. I’m working on setting up a dedicated night with London Bike Kitchen, and I’ll keep you posted on that. Once you have a dedicated space, you can volunteer (and volunteering for good organisations of course has all sorts of other great outcomes). But I think ideally you’ll also need some ‘teaching’. Now I know that a lot of people prefer the idea of skill-sharing, and learning informally from your peers and friends in the workshop, and I think this has a lot going for it, especially if you don’t mind taking your time in learning new things. But if you want to learn quickly, and have more well rounded skill-set, then maybe a course is the way to go. I personally got unsatisfied with learning slowly, the pieces of the puzzle weren’t fitting together, and there were so many questions I didn’t know the answer to, and couldn’t hassle my more experienced mechanic friends about, so I decided to take a formal course. Luckily I could pay for this, but Bikeworks for example has the Cycle Into Work course, which trains vulnerable adults as bike mechanics for free, there are also short courses for less than £100 run by many different organisations. But for a comprehensive, longer course Cytech level 2 is the industry standard training, and a well recognised qualification in most bike shops, but I chose to be trained by Bikeworks, because politically they are a lot ‘better’, being a not-for-profit social enterprise which does all sorts of good stuff (see their website…). The City & Guilds VRQ level 2 training they offer is very similar to the Cytech course, and it has got me a few job offers already! I did the course on weekends in London, and I learned systematically all about how bikes work and how to fix them. The highlight was probably building wheels, something you don’t often get to do even as a professional mechanic.